A criminal investigation into "a number of allegations", including assaults, at Deepcut Barracks has begun. Surrey Police launched its new probe in the wake of an inquest last year which concluded the death of a recruit at the base was suicide. 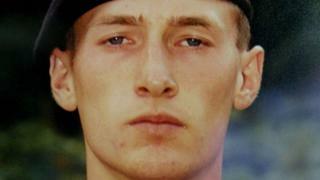 Pte Sean Benton was the first of four recruits to die at the barracks from gunshot wounds between 1995 and 2002. The investigation is also looking into claims of misconduct in public office, a police spokeswoman said. Pte Benton, 20, from Hastings, was found with five gunshot wounds to his chest at the Surrey army base in 1995. The new inquest, ordered following a campaign by his family amid allegations of bullying at Deepcut, heard evidence from more than 170 witnesses. Shortly after the inquest began, the Army apologised and said there were "a number of things that could and should have been better". Surrey Police said its new investigation, covering a period from the mid 1990s to the early 2000s, was launched in October after the force "reviewed the findings documented by the coroner and the Benton family's request for a new criminal investigation into allegations of assault and misconduct in public office". "As this remains a live investigation, it would be inappropriate to comment further at this time" it added.